Meet Amelia, our latest edition to the fleet! She's only been with us since March and she's excited about her upcoming adventures. 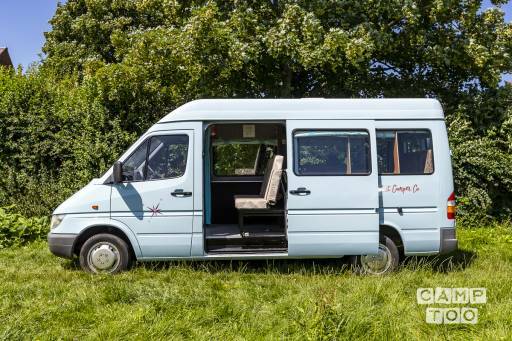 She has 4 belted travel seats to keep you safe, as a clever layout to accommodate a party of 4, she's easy to drive, has stacks of storage and has a flushing loo! Amelia's very sociable and provides plenty of seating inside. The travel seats transform into 2 facing bench sofas. Another swift and easy transformation turns the seating into a dining area with a central dining table for meals or playing games. 'me-time' in a snug cosy place. by clicking up the backrest in to bunk position. And with the cabin windows the perfect height for peeking out, you can watch the end of the day or the start of the new one! The top bunk, if required, is accessible by a ladder (safety net provided if needed) and easily returned to the sofa when not in use. and a 3-way fridge (12v, mains and gas). There's plenty of storage too, so you can bring lots of goodies! The lower bunk houses under bed storage accessed internally and externally via the back doors. And there's in a sideboard locker and drawer, plus storage space under the travel seats too. Amelia can run both on and off-grid, with lights, water pump and flushing loo running from the leisure battery and the fridge and hob run from gas. For periods longer than 3 nights, we recommend electric hook-up for optimum use. Amelia has a radio with bluetooth / USB and auxiliary input for playing music when driving. Event shelter, outdoor furniture, BBQs, firepit, pop-up tents, gazebo, bedding and more. Additional mileage and gas cylinders can also be purchased. We also have some home comforts you can use at no additional charge (but subject to availability, so please ask at time of booking!) such as a toaster, kettle, slow cooker and mini electric radiator. A 2001 Mercedes Sprinter 2.2l. Fuel: Diesel. Manual 5 gear.